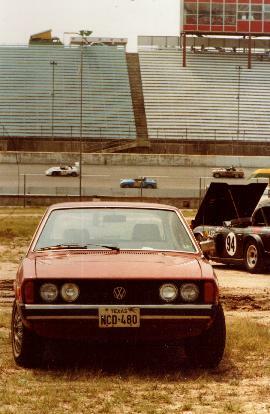 My 1976 Scirocco at the Texas World Speedway in 1979. Note the unusual high beam bulb on the RH side: it's a 400,000 candlepower aircraft landing light, marketed under the name "Penetrator" for about 10 bucks apiece in the 70s. It lit up a sign at a mile and a half, but you could never turn it on!